Figs B3.16, 18, 21, 26, 28, 45, 46; C12.1–7. Species recognition. 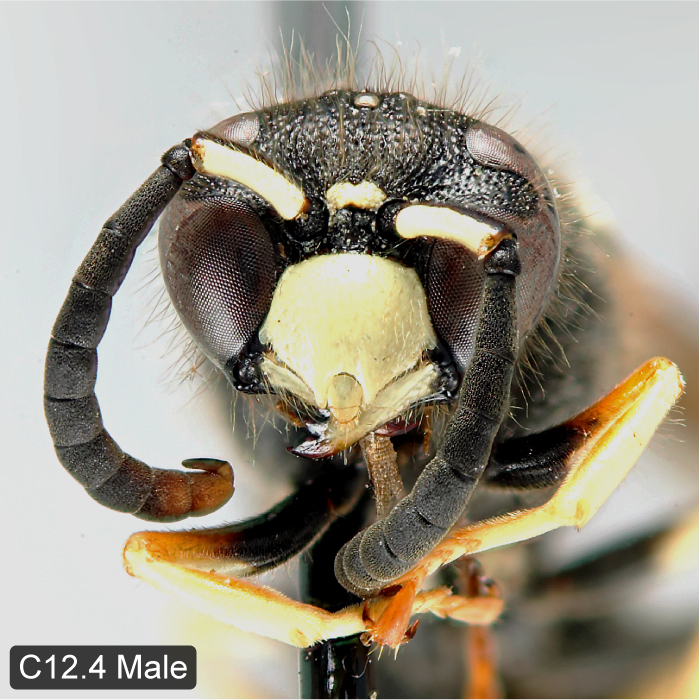 The male is unique among the species of the study area for its deeply emarginate clypeal apex (otherwise only found in one Mexican species). 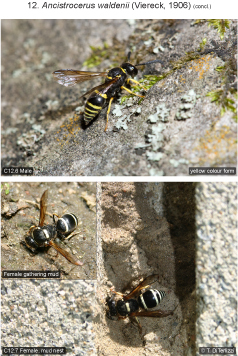 The female is very similar to females of A. albophaleratus and Ancistrocerus sp. A. 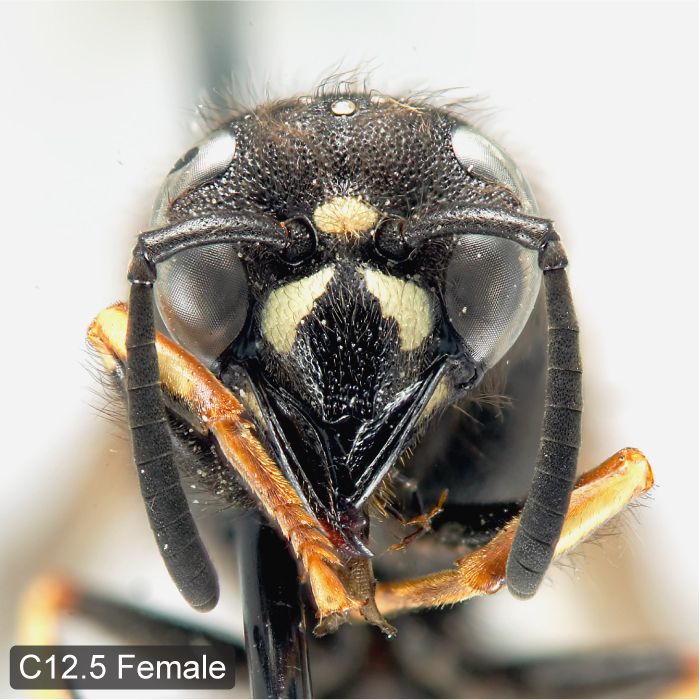 Additional distinguishing characters include: pale spot between eye margin and antennal socket almost never present (spot present or absent in A. albophaleratus, always present in sp. 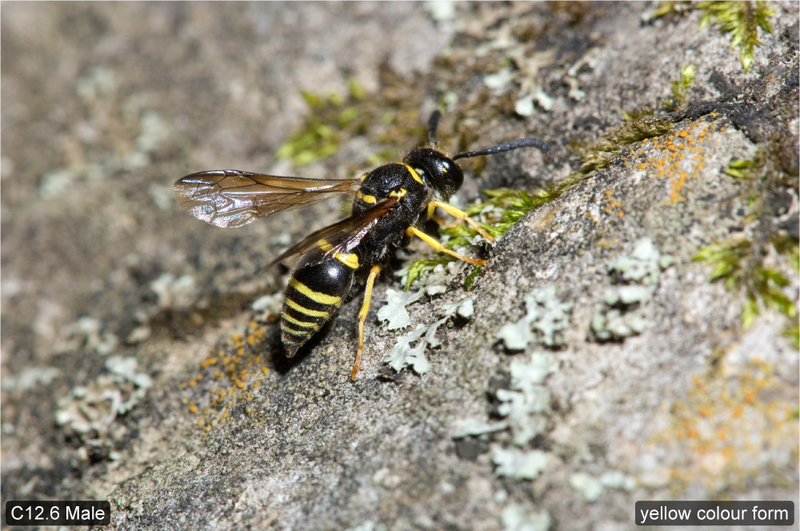 A); clypeus with relatively large dorsal spots (almost always more closely approximated medially than antennal sockets, rarely confluent) and usually without ventral spots; the latter, if present, small, never confluent, and then dorsal spots very large (in sp. 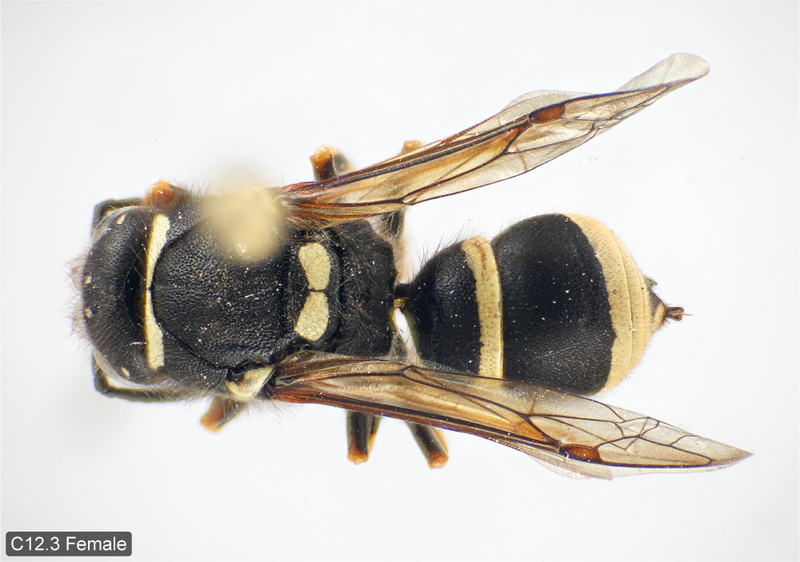 A dorsal spots more widely separated medially than antennal sockets; ventral spots always present and sometimes confluent; spots variable in A. albophaleratus); scape completely black (in other species at least ventrally or posteriorly with yellow to brown stripe); sternum 5 almost always with pale apical markings (absent in some western specimens; present or absent in sp. A; absent in A. albophaleratus); tergum 6 with pale apicomedian spot (according to Bequaert, 1944a, rarely absent; absent in A. albophaleratus). Variation. Fore wing length 6.0–9.0 mm (♂♂), 8.0–10.0 mm (♀♀). Pale markings of body usually ivory. 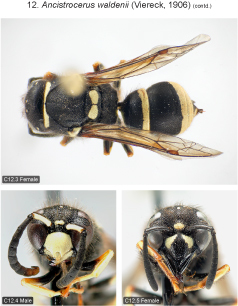 Two males from Virginia (the only specimens from this state examined by the authors) have bright yellow markings (1 ♂, Giles Co., Cascades Recreation Area; 1 ♂, Giles Co., White Rock Recreation Area; both DEBU). 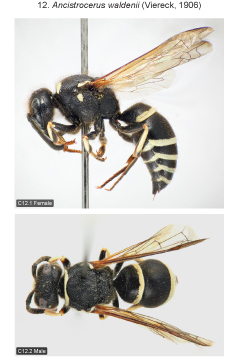 Previously, yellow-marked specimens were only known from British Columbia and the western U.S. (ssp. excavatus and ssp. flavidulus, see below). Female clypeus usually with a pair of dorsal spots only (often absent in western specimens), in xanthic specimens the spots rarely confluent. 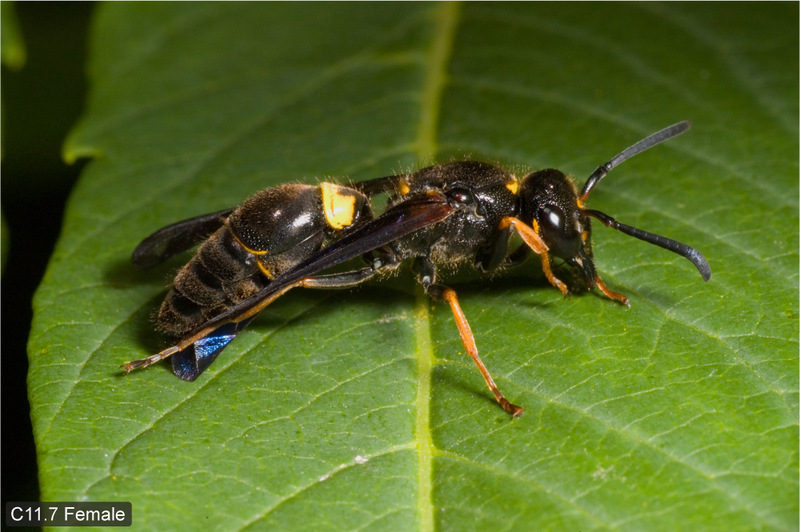 Yellow spot along inner orbit almost always absent in female (exception: 1 ♀, QC, Luskville, CNCI) present or absent in male, never with spot between inner orbit and antennal socket. Male scape black on posterior portion of ventral surface except rarely in yellow or yellowish specimens where yellow/brown area may extend to posterior margin of scape (1 ♂, VA, Montgomery Co., Pandapas Pond, DEBU). 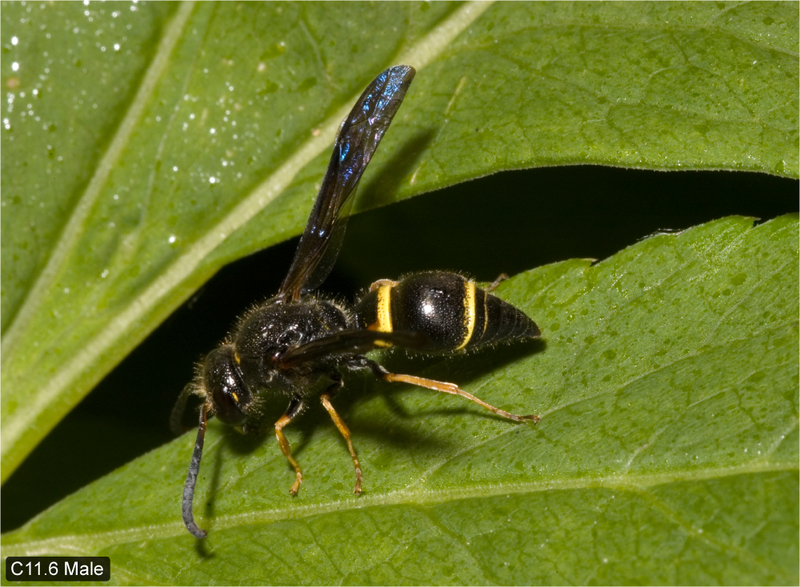 Spot on upper mesopleuron present in female (often absent in western specimens), rarely present and then small in male. Parategula black. Pair of pale scutellar spots almost always confluent or separated by a hair line (in western specimens usually well separated, rarely absent); in male well-developed to absent. Metanotum almost always black, exceptionally (1 ♀, ON, Vineland, DEBU) with a pair of well-developed pale spots. Metasomal terga 1–5 (female) or 1–(5)6 (male) fasciate, tergum 6 of female with pale spot. Female sterna 1–3, sometimes also 4, very rarely 5 with complete apical fascia (on sternum 1 sometimes obscure or completely absent); at least laterally interrupted fascia present on sternum 4 (apicolateral spots only in some western specimens); at least apicolateral spots present on sternum 5 (absent in some western specimens). Male sternum 1 sometimes with more or less developed apical fascia, sterna 2 and 3 with complete fascia; sternum 4 sometimes and 5 very rarely with complete fascia; sternum 6 black or with apicolateral pale spots. Distribution. Transcontinental in Canada (Krombein 1979), recorded from LB by Bequaert (1944a) and from YT by Finnamore (1997). 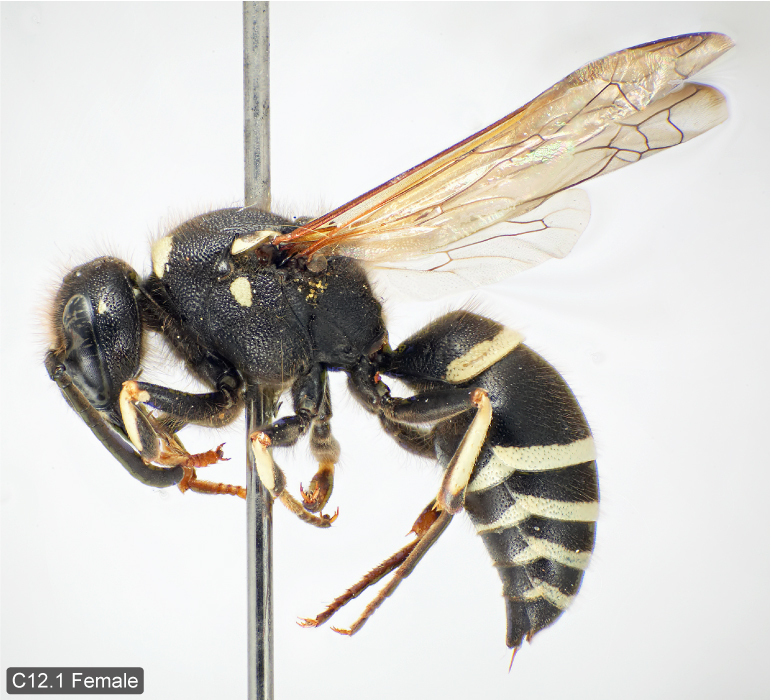 We have examined specimens of the typical subspecies from every province and territory in Canada except LB and NU. Northern U.S. including AK, south to VA, MI, IL, SD, CO and NM; the western ssp. excavatus Bequaert, 1944, and ssp. 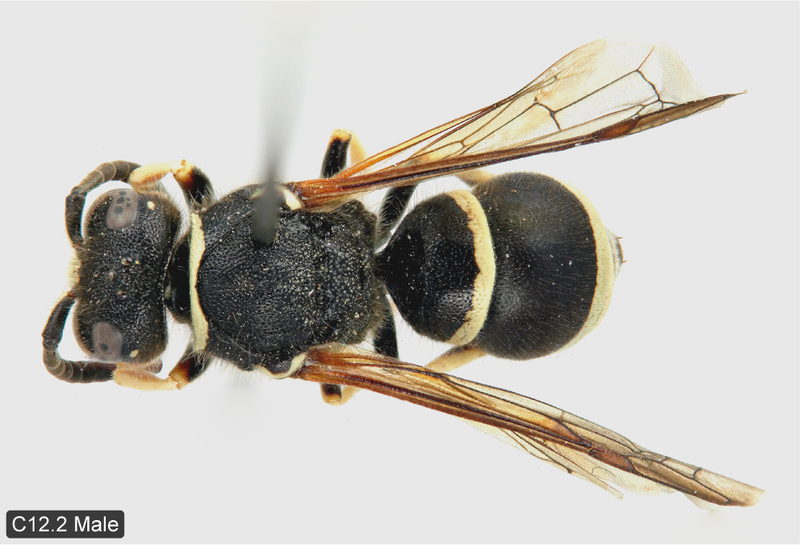 flavidulus Bequaert, 1944 occur from BC to CA and east to MT, WY, CO, AZ (Krombein 1979). Biology. 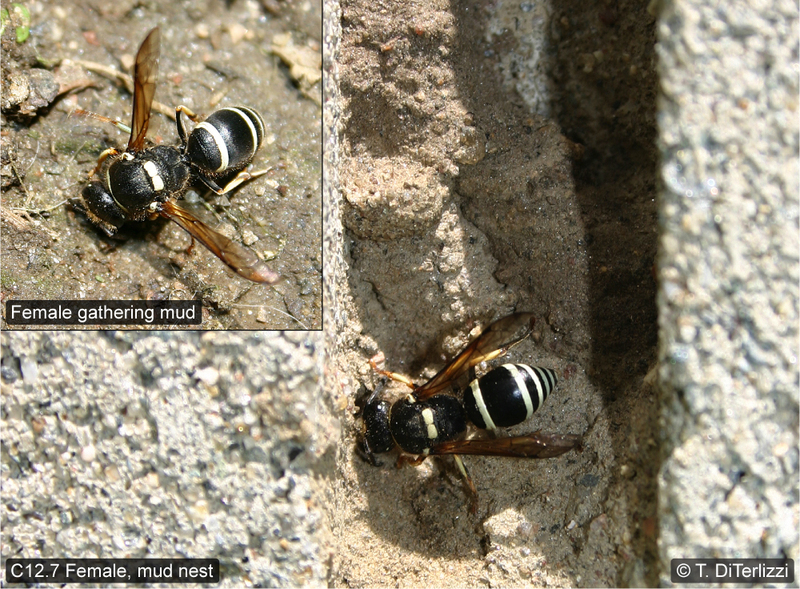 Builds mud nests on walls or rocks or in cavities in mortar. Tortricidae have been recorded as prey of ssp. flavidulus (Krombein 1979).